If you’re looking for a simple comfort food dinner (or lunch) that tastes like fall– this is it! 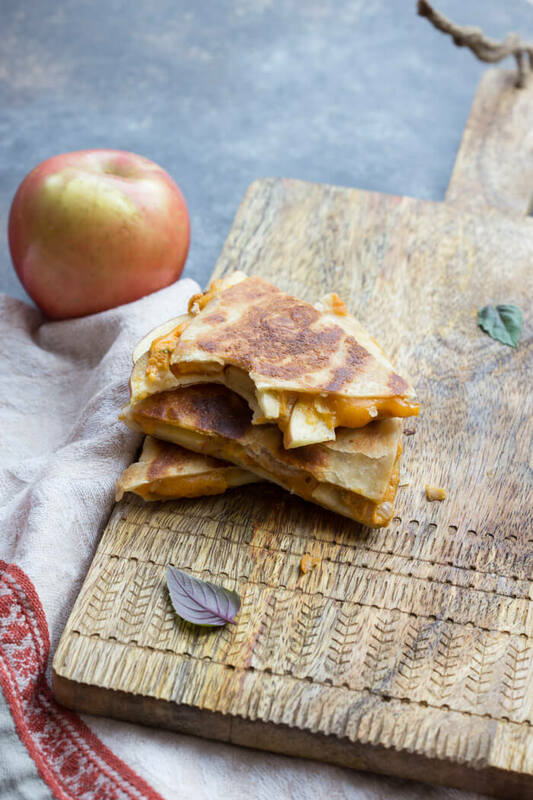 Creamy Pumpkin Apple Quesadillas are perfect for little hands for snacking after school or before trick or treating. Happy Halloween frands!! This pregnancy quesadillas have been my jam. 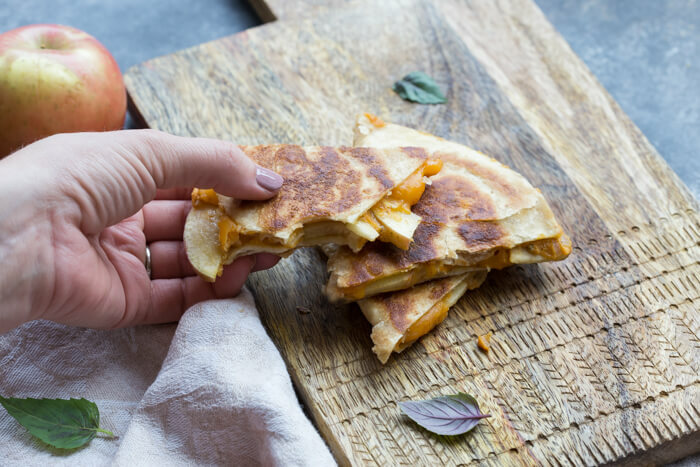 These Creamy Pumpkin Apple Quesadillas are stuffed with… you guessed it: Pumpkin Vodka Sauce and sliced honey crisp apples. Did the recipe title give it away? I love these delicious slices of golden perfection and so does my toddler. I think the big reason I make quesadillas so much is they are easy. It’s something that I can quickly whip up for lunch after school or for a low key dinner when I need something FAST. Toddlers can be demanding, especially when hungry. Hanger is a real thing. 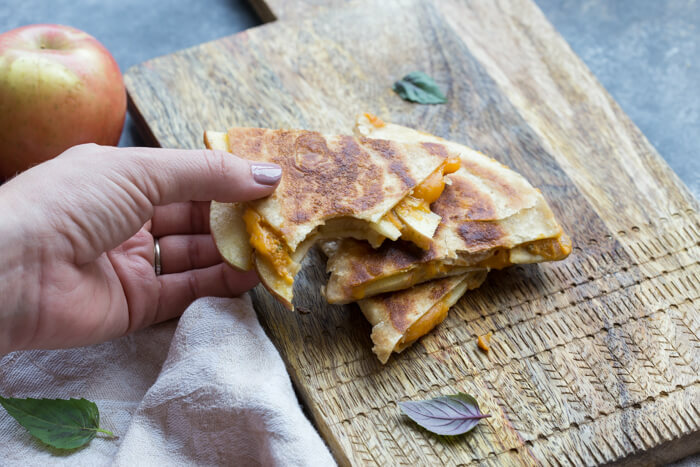 There usually isn’t any griping when I serve up quesadillas like these Creamy Pumpkin Apple Quesadillas, on his toddler plate. And he will let me know if he’s unhappy with the meal I make– like last night for dinner we had blistered green beans, sweet potatoes, and shredded pork and he didn’t even touch it. He usually eats shredded pork when we are out and likes green beans most nights, butttt apparently not last night. So after 30 mins of sitting in the high chair he WHINED for cheerios and dried tart cherries for dinner. Toddler wins. Mama can’t send him to bed hungry at this age…it would break my mama heart. But we adults sure enjoyed our dinner! Sometimes dinner is geared more toward us and other times it’s toddler approved quesadillas. 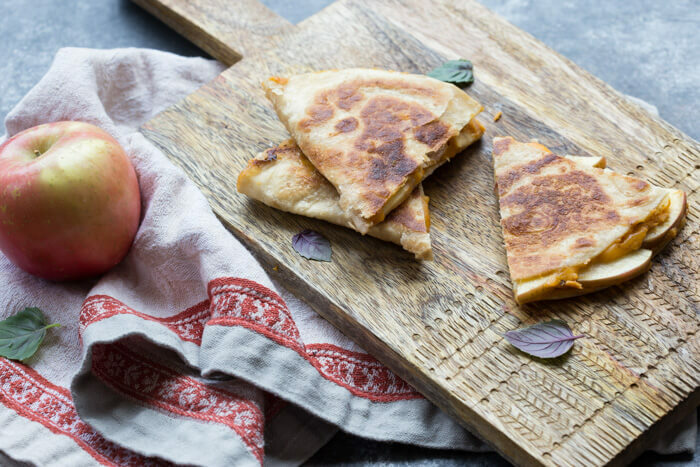 Creamy Pumpkin Apple Quesadillas for the win! Heat butter in cast iron skillet over medium high heat. Once butter is melted, place one tortilla on skillet and spread entire surface with 2 tablespoons of pumpkin sauce. 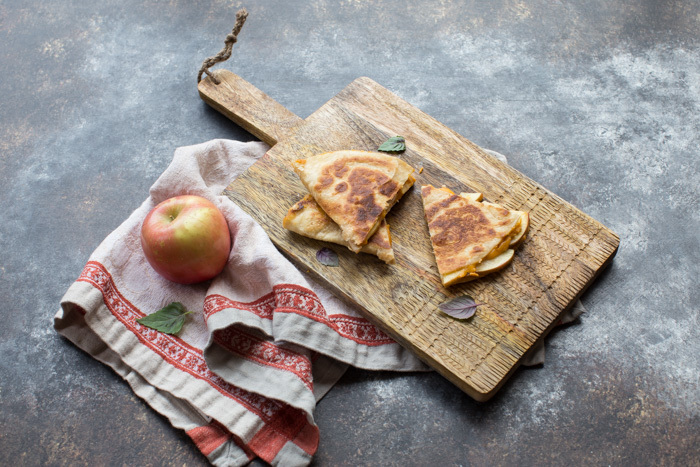 Layer tortilla with 1 ounce cheddar cheese, and arrange sliced apples on half of tortilla. Adjust heat to medium heat, if needed. When cheese is slightly melted and underside of tortilla begins to turn golden, fold tortilla in half and press down to finish cooking for a minutes. Flip if necessary to get golden brown crust on both sides. Place warm quesadilla on cutting board and allow to cool for few minutes before cutting into three three or four triangles. These are so fun! Love that you’ve combined pumpkin and apples. Never would have thought to put them together in a quesadilla, but it’s brilliant! Creamy, cheesy and buttery? That’s cozy food at its finest! What a delicious flavor idea! I think I modify this to fit our dietary needs and I know my husband would enjoy it. If this doesn’t scream fall I don’t know what does! Sounds delish! Sounds like such a great combination. I bet these quesadillas are amazing! 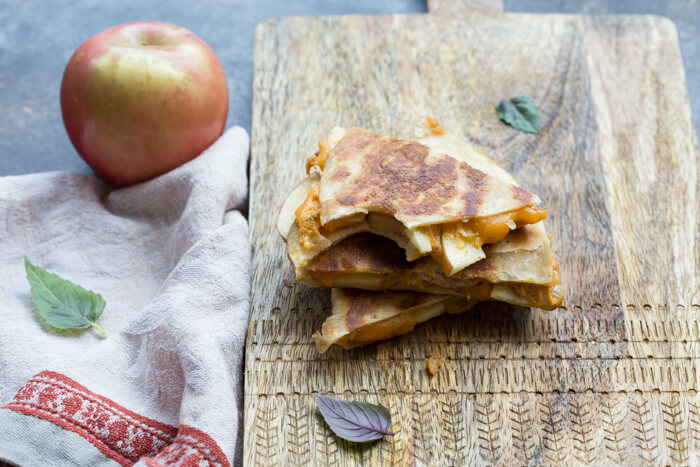 Pumpkin and apple in a quesadilla- sign me up! These look and sound like they taste just like fall- what a treat! Yum! These sound amazing!! I put apples on my pizza recently and loved the savory meets sweet flavor so I know I’d love these too!